Revisiting books is something I’ve done since I was tiny, since I would read through books faster than I could get my hands on new ones. I know that for a lot of people, the thought of having to reread a book is the worst thing they can imagine, but it’s something that’s always made sense to me – if you fall in love with a character, a story or a place, why would you deny yourself the chance to experience that all over again? I can’t remember how old I was when I first read Goodnight Mister Tom, but I do remember reading it about five times in the first couple of years after first picking it up. The book follows a young boy, William Beech, as he is evacuated to the countryside during the second world war. Like many children’s books, Goodnight Mister Tom deals with a lot of serious issues, such as war, loss, child abuse and loneliness, but it is also a book about love, friendship and finding courage in the most difficult of times. I first read The God of Small Things when I was doing my A Levels, and it was one that I decided to revisit myself in the final year of my degree, for an essay I was writing about postcolonial articulation. When dissecting a novel word by word during one of the most stressful periods of your educational life doesn’t threaten your love for the text, you know it’s one you will be reading forever. Not only is The God of Small Things a really important discussion of the damages of imperialism, it is also a tragically moving story. But the thing I love the most about The God of Small Things is the voice that Arundhati Roy creates for the young twins – not only does it ingeniously capture the innocence and intuition of children, but it picks apart language in a way that highlights both the peculiarities of the English language and the cruel truths of colonial rule. When Ammu was really angry, she said Jolly Well. Jolly Well was a deeply well with larfing dead people in it. I’m not usually a big reader of romance novels, but The Time Traveler’s Wife is a big exception, and it’s one I’ve read multiple times over the years. Narratives about time travel are hard to pull off, especially when they are cemented into our own reality, rather than some far-off universe, but it is the undeniable credibility of Niffenegger’s time travel that makes this book such a success. This beautiful and heart-breaking story is cleverly structured in a way that scatters each episode across time, and it is impossible not to get caught up in the development of the plot and its enthralling protagonists. I might be cheating a little with these last two as I’m including the whole series, but attempting to choose single books from within this series would present another predicament that I’m just not willing to face. 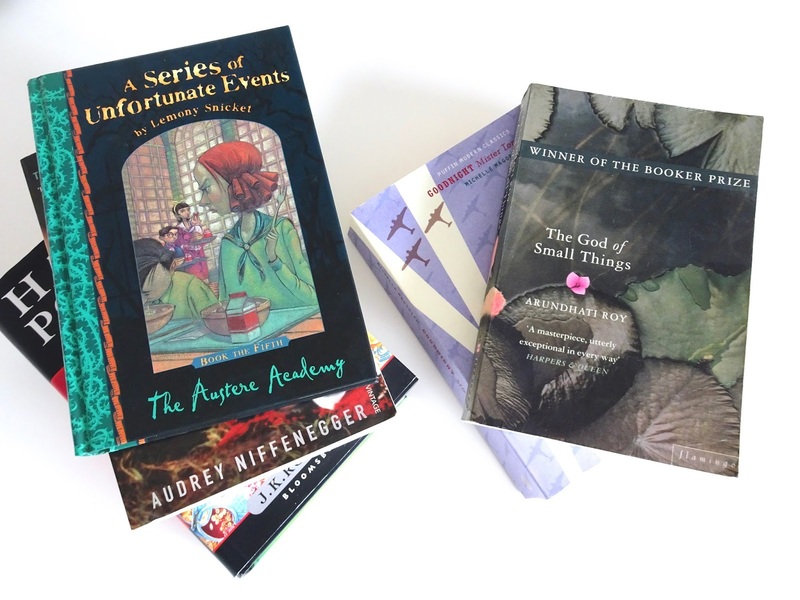 Although I loved A Series of Unfortunate Events as a child, in order to fully appreciate the genius of Lemony Snicket’s writing, you definitely need to revisit these books as an adult. I’m yet to come across anything quite like this series, its fascinating characters and the ridiculous events that occur across the thirteen books. Well it had to be done, didn’t it? The Harry Potter instalments were without a doubt the books I reread the most as a child and teen. I did wonder if having three children’s books on a list of five was too much, but then I realised that it just proves the beauty and magic of children’s fiction (if there even is such a thing); these stories have stuck with me for years, and are just as compelling as ever at the age of 22. Fiction doesn’t get much better than that. Which books would you read again and again? Let me know in the comments! I've only ever watched the film of Goodnight Mr Tom but I would love to read the book! Great post!